i'm the first to say that i'm not the pickiest eater in the world. in fact, i have pretty low standards and would eat almost anywhere, and appreciate almost anything and give glowing reviews of even the lowliest of restaurants. but at times i hear myself saying the most disturbingly elitist things about food, particularly because i have very accurate taste memory: basically, my tongue remembers flavors, and if i've been to a really good restaurant, upstarts might just pale in comparison. one time i told people that this restaurant served poor man's steak; another time i was asked where good thai food could be found and i flatly replied: bangkok. as a matter of fact, these statements are true, particularly the last one. i have made several trips to the kingdom and i can honestly say that i have sampled the best of thailand's kitchens: cuisines coming from the breezy north to its sunny south, and everything else in between. just recently, i ate at the thai bistro in robinson's magnolia and was pleased to find that most of the items on its menu were named after BTS stations: sala daeng, chit lom, phloen chit, etc. but i didn't have any of the usual thai dishes: your different-colored curries, fish salads and flat noodles. instead, i had something rather obscure, the original version of which i ate when i went to chiang mai some 4 years ago: the khao soi. when i touched down on the northern city, the first thing we did was eat at some back alley restaurant which served these delicious bowls, of which my friend pitsanu had loads of praise to say. 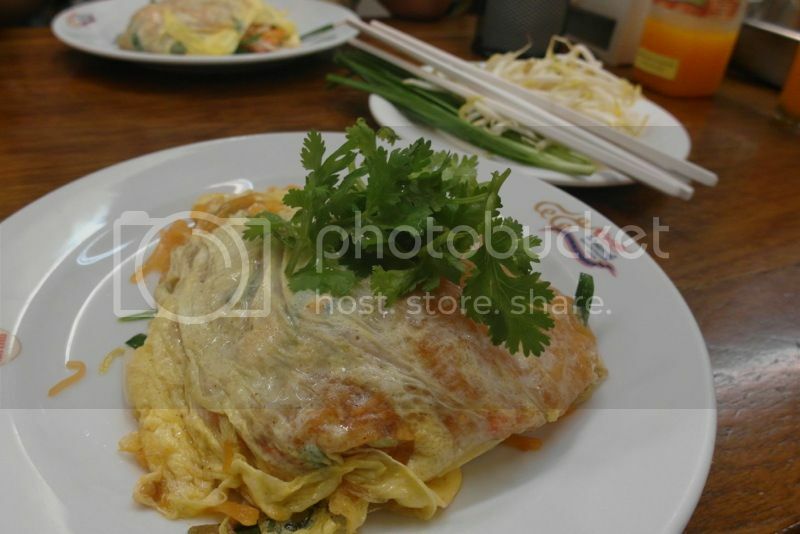 this dish actually has burmese origins, and i remember having it as well while i traveled through bagan. 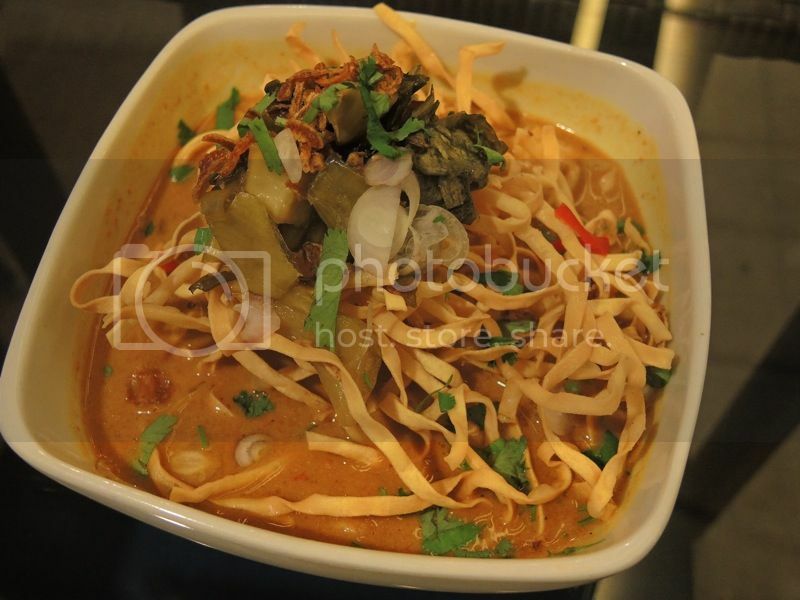 the khao soi consists of crispy egg or rice noodles soaking in a thin curry broth. although i much rather prefer the hand-cut noodles from either myanmar or thailand, thai bistro's version was delightful because it allowed me to travel back to certain places i knew, although the trip was blurry and short. part of the reason why i say you only find good thai food in thailand is that the versions we find here are often adjusted (i.e., diluted) to suit our palate. while that's good to a certain extent (particularly for me since i cannot eat spicy food since i literally have strange biological reactions to it), the lack of authenticity to the flavors subtracts from the gustatory experience. 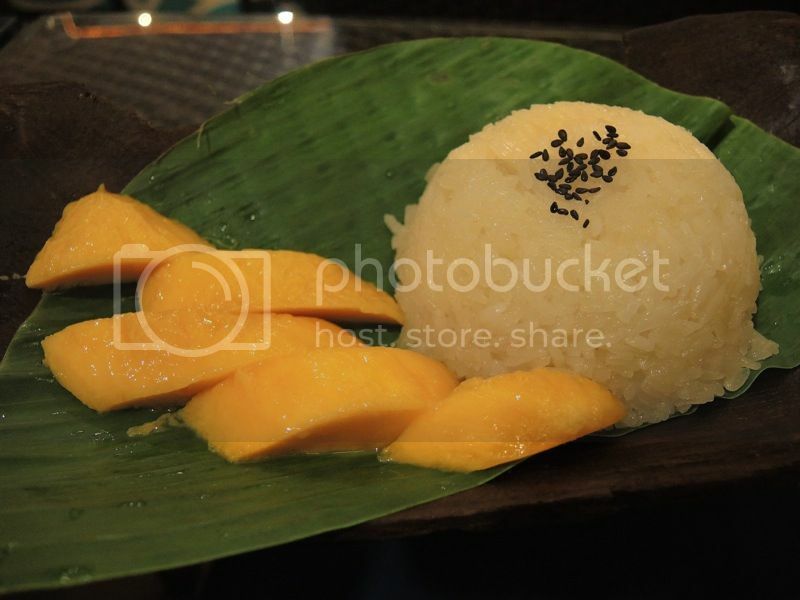 my thai bistro meal was marred by two things though: there was a live insect in the plate where they served my mango sticky rice, the kind you'd find crawling out of a container of flour or rice. also, there was a foreign object inside my glass of water. i just directed the waiter's attention to them but said no more. i once encountered a short strand of hair on my salad plate in mamou but made no fuss about it. like i said, i have low standards, and i do believe these things happen even to the best of us. in my recent trip to bangkok, i managed to coax my friend pitsa to take me to eating places outside the radar of most tourists. although the internet has many sites where people can weigh in and make recommendations on where to eat and stay (tripadvisor is one of them), there is nothing like the knowledge of a local. and thanks to my participation in the singapore international foundation ASEAN visiting students' fellowship back in 1997, i have friends across the region with whom i still keep in touch. pitsa is one of them, but pitsa is something else: he's a licensed tour guide. remembering how amazing my pad thai experience was during my last visit, i asked pitsa to take me again to what arguably is the best pad thai in all of bangkok, and if pitsa were to be believed, probably all of thailand. thipsamai is found near the bangkok city hall -- not far from the democracy monument, golden mount and khao sarn road. it's on the street that runs parallel to the mahakan fort. 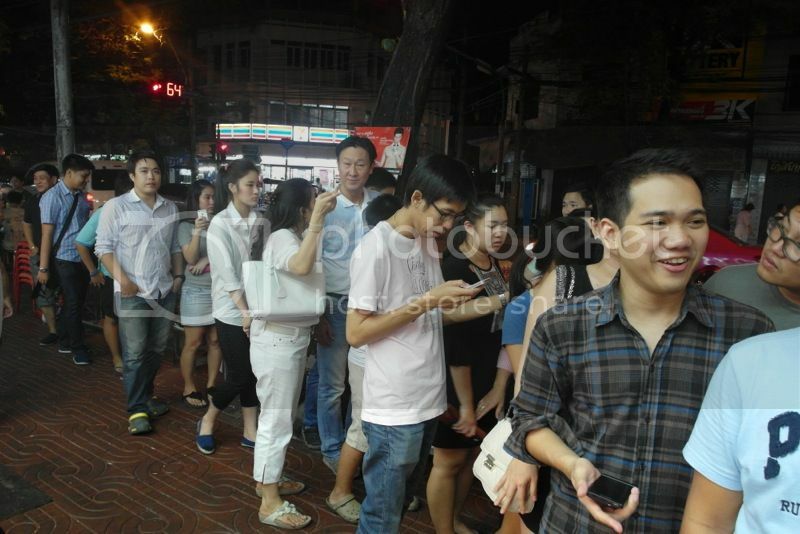 not a single thing had changed since i was last there: there were still long lines that spilled onto the sidewalk, the same area where an army of cooks prepare the famous noodle dish on giant woks that sit atop burning blue flames. 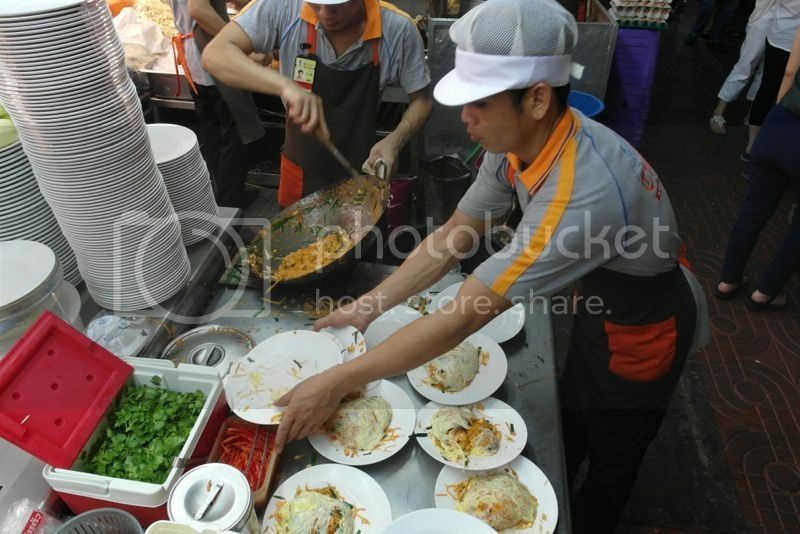 they are surrounded by leaning towers of plastic plates and styrofoam boxes, and the floor they stand on is sprinkled with bits and pieces of the famous pad thai. it was drizzling when we came, and tables had to be set up under temporary awnings, extending to the street corner. a man was selling freshly squeezed orange juice outside. another man had a chest type freezer filled with ice cream. the walls inside the restaurant were filled with magazine as well as newspaper clippings and old photos of the beginnings of thipsamai. the white tables were all filled with people, but the turnover was quick: they came, wolfed down their plates, and left. i sat down with pitsa and we didn’t wait long before our plates of egg-wrapped flat noodles arrived. it perplexed me how perfectly covered the pad thai was in a ball of fried egg, and i had to make a video recording of the intricate method that the cooks applied, which involved skillfully rolling the wok with one hand while the other poured the noodles. our plates had sidings of sliced lime and green stalks of some unnamed but aromatic plant. between us we had two servings of pad thai and a 750mL of the orange juice, and when i asked for the bill, i remarked: why didn’t we order more? 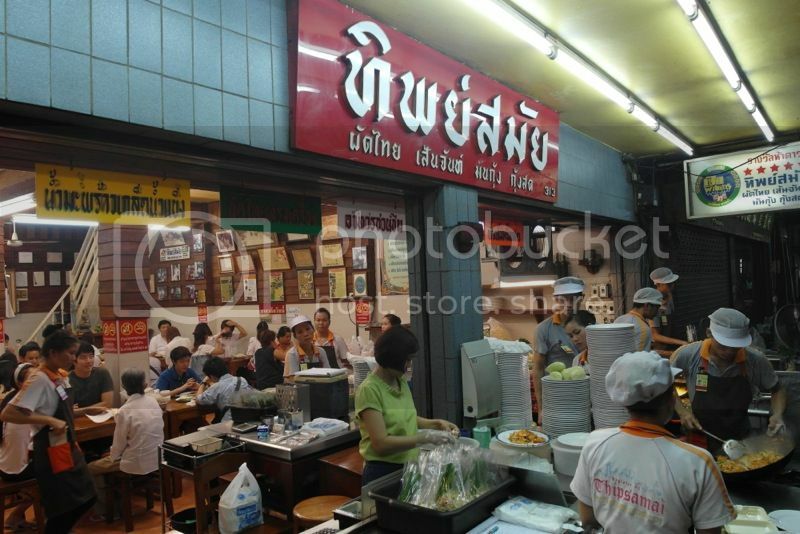 pitsa revealed that thipsamai’s good food is affirmed by a ubiquitous stylized green bowl. according to him, a famous thai restaurateur awards this elusive symbol to a select number of thai holes in the walls, and anyone observant enough might notice it scattered in dingy markets and dimly-lit alleyways across the kingdom. it’s a good guide to strangers and foreigners wanting to know where to eat, like a local miele guide, or a more accessible michelin star rating, and one might find it in the most unlikely of places: even the ambulant sticky rice vendor in kanchanaburi sported one on the roof of her trike. 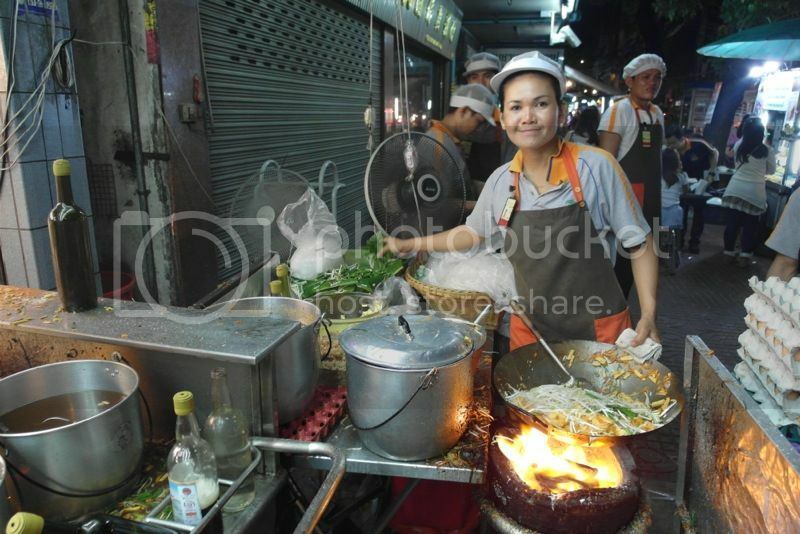 the amazing thing about the food in bangkok is that it has restored some dignity to the notion of street food. while i know so many filipinos who swear they cannot be seen in some places, or who avoid carinderias and turo-turos and sidewalk vendors like the plague (or because they might cause a plague), the enterprising thai cook encounters less hostility. one might find a parked mercedes benz just beside a makeshift kitchen whose sanitary standards might be put to question. and this really does beg the question: why are we inclined to be more gastronomically adventurous when we are in places where even our stomachs might be unfamiliar with the germs that get served with our food?